Aside from providing comfort, Luxura hollowfibre cushion pads can be used in bedrooms and living rooms to transform the aesthetic appearance of a room. These hollow fibre cushion pads come in different shapes and sizes, so you can easily choose the types that will suit your bedroom or living room. In terms of pillow number, you want to go for an odd number, such as 3 or 5. A couple of big polyester cushion pads will look better and cleaner than a bunch of smaller ones. Square pillows are good to showcase a solid pattern or color, while oblongs offer a nice foil. As far as the fabric is concerned, you want to go for a limited color palette with large prints as they work well in modern environments. To achieve a more traditional look for your living room, use 2 or 4 large pillows and place them on both sides of your sofa to have a sense of symmetry. The size of your polyester cushion pads or throw pillows will depend on the size of your sofa. In terms of the fabric, silk and velvet look good in a traditional setting. Go for a variety of patterns, textures and colors so things will look lively. If you want an eclectic look for your living room, an even number of pillows and cushion pads will work well. You want your hollowfibre cushion pads to look like they just happened to be there. As for the size and shape of your pillows, choose pillows with similar sizes. Make sure also that there is at least one color in common among your cushion pads or pillows. Consider the size. Standard square hollowfibre cushion pads work well with sofas that have regular dimensions. Oversize pillows have a more casual feel, so if you have a modern sofa, go for smaller ones. Mind the fill. A feather and down pillow offers more squish, and it can also be the priciest. On the other hand, polyester cushion pads are stiffer and they hold their shape. Odd number of pillows is good. Odd numbers are often more artful when it comes to design. Use 3 or 5 pillows depending on the size of your sofa. 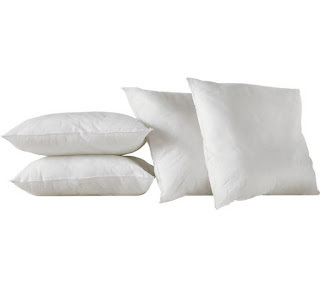 Mix your pillows. Match a pair of solid square cushion pads with the color of your sofa, one oblong pillow on the center of the sofa, and a pair of patterned, oddly shaped pillows. This combination of pillows will make your living room look more lively. Take into consideration the entire room. When choosing the size, shape, or color of your polyester cushion pad and throw pillows, don't forget to think about how they will blend in with the decoration or theme of your living room.